We’ve learned a lot of things in our first full year of business here at LevelEleven. One of those is just how much animated GIFs can do. It all started on August 20. Account Executive Craig Dulman closed a deal, and the entire team got the usual “New Deal Won” email that let us know. We each proceeded by typing typical words of recognition, which were sent back to everyone else on the email string so that each new “atta’ boy” went public. Bam – nice work, Craig! Good stuff man. Many more to come. From then on, our recognition culture changed. One by one, the team adopted the trend Vince started, until responses to deal notifications became one funny celebration GIF after another. We suddenly had a new, free sales incentive. Today, these emails do more than act as a source of recognition. For one, they reinforce the fact that we work in a fun culture. Speaking from personal experience, when a GIF of Will Ferrell playing cowbell arrives in your inbox midday, you know you’ve landed somewhere you want to stay. In small ways, the GIFs help to bring us all together, too. When a team member turns to you and says they respect your decision to choose a GIF of Walter Mathau dancing down the sidewalk in Grumpy Old Men, or when you’re a person who loves The Office and receives a GIF of Dwight doing karate, you’ve just bonded with a colleague over something more than a shared 9 to 5. And on days like yesterday, when the entire team stressed over hitting our year-end goal, a bunch of crazy GIFs can add a few smiles to relax anxiety, while enforcing celebrations around small wins, along the way. Plus, seeing others receive the emails can fire you up. Who doesn’t want to see a flood of incoming GIFs sent directly their way? As sales leaders move on to 2014, they all have a list of new sales strategies they’ll carry along. If you’re one of those leaders, make GIF-based recognition one of those strategies. You are making it look so easy. Okay, now it’s time for you to get ahead of the game. Click here, find a GIF that would make your team smile, save it. Then just try to remain patient until the next deal closes. 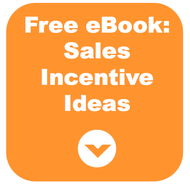 There's one free sales incentive you really should offer in 2014. Guess what? It's free.